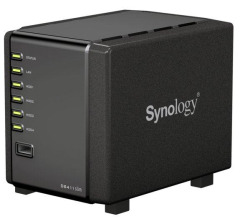 Synology® DiskStation DS411slim is designed to provide users with a compact yet feature laden solution for easy file sharing and backup. Snap-in 2.5”hard drives design brings low power consumption, quiet operation, reliability and easy disk replacement in a compact size. The operating system, Synology DiskStation Manager, delivers rich features for multimedia enjoyments, Internet sharing, worry-free data protection and energy-saving options. BigEye Infared Motion (motion detection).